I tried for a better photo of the snowball quilt top after it had the borders sewn on. The reds look a little too bright on my monitor. As usual, it is prettier in person than in a photo. I cut the borders on the lengthwise grain and have matching borders on opposing sides. In 2 yards of fabric there were only 2 repeats across the fabric so all 4 borders couldn't be the same. I have 2 narrow strips and one wider strip leftover that I can cut up for other projects. The cookies are baked and the art quilters are coming today. You keep me in a state of envy over the beautiful quilts and your productivity. Love what you do. Thanks for sharing. This quilt turned out fabulous! Cookies - my goodness you seem to have been baking a lot of cookies lately. I love cookies. I need to get to baking some! That looks so pretty. Enjoy your group today. Fantastic. Especially like the added detail of the border around the center with the top piece darker than the others. Another great job. This is a beautiful quilt Wanda. What are you going to call it ? I mean, what name will it be ? Don't you think this has to replace one of your "current favorites" on your blog? They haven't changed at all since I've been following you. Not a complaint - just wondering whether you forgot about it? An especially beautiful quilt, Wanda. I wonder about a name too. Something musical perhaps since it really sings. 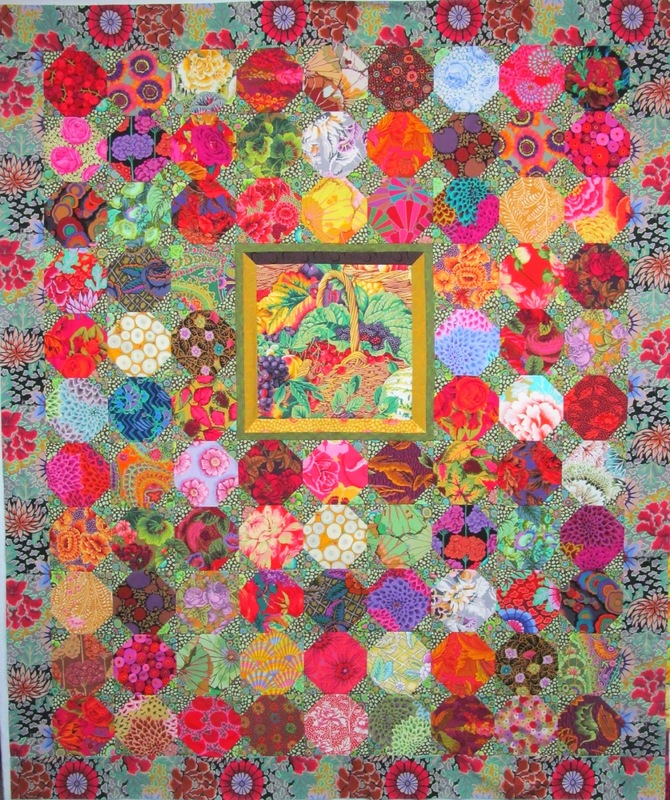 Love that 'frame' in the center - what a beautiful quilt. Just beautiful!!!! It goes without saying that I think your Dream fabric for the border is just perfect. What a grand piece to show for the beginning of the week. It is absolutely breath taking ! ! ! Love your 'garden walk' from Saturdays post... my sister gave me several clusters of Illinois violets the last time we were in IL. and I guess it is our elevation that they just can not take hold. How I love the deep purple of those blossoms. The ones I have are a pinky, lavender. Don't even know where they came from they just come up all over. I so enjoyed catching up with all your posts today, from the frosted creams, to all those awesome quilts you gifted family at the shower. You are one magnificent hostess ! Loved seeing all your gorgeous blooming tulips... go figure... mine have come and gone already. Our weather kids tell us we are a month ahead of our regular season. We are in the mist of grade school and Senior H.S. 'end of the year events'. And so busy just keeping up with it all is hard to keep up for us old duffers. It is beautiful! Love how it turned out.